Evergreen Aviation's 747 Supertanker has the same capabilities as any long-range Boeing 747, except that thanks to 20,500 gallons of tank space, it's the world's biggest fire extinguisher. The plane made a first-ever U.S. drop over LA yesterday. 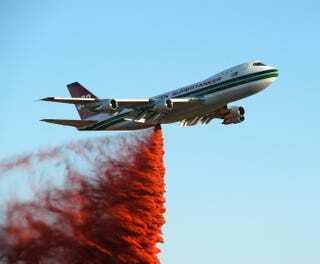 With fires blackening more than 105,000 acres around Los Angeles, authorities called in the world's largest fire extinguisher - the Evergreen 747 Supertanker, capable of dropping 20,500 gallons of retardant over a three-mile-long strip of land. The plane made its first-ever drop in the continental United States when fire officials summoned it to the Oak Glen fire east of Los Angeles on Monday mid day. After the successful first drop, the Supertanker was called back into action Monday evening where it made further drops on the massive Station fire north of the city which grew to more than 164 square miles and threatened some 10,000 homes. The Supertanker's been modified to dump a wide variety of chemicals to deal with everything from oil spills to radiation. In this case, fire-fightin' was the modification of the day.